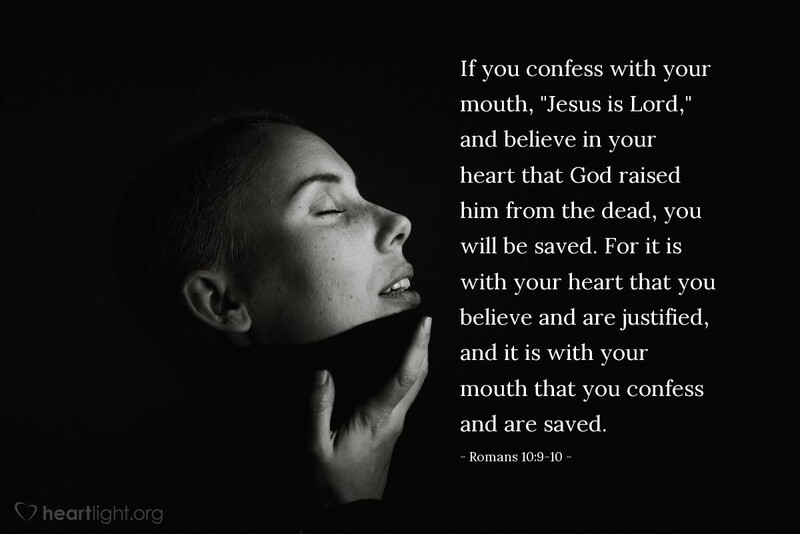 If you confess with your mouth, "Jesus is Lord," and believe in your heart that God raised him from the dead, you will be saved. For it is with your heart that you believe and are justified, and it is with your mouth that you confess and are saved. Imagine Jesus being proud of you! He said if we confess him before others here on earth, he will speak up for us in heaven. Confessing Jesus as our Lord is simply acknowledging the truth. But for believers, it is more than that, since at the close of time every knee will bow and every tongue confess his name. For us, confessing Jesus is anticipating his triumph in which we will share. Mighty God, your Son is my Lord. I love him and praise him for his redeeming sacrifice. I thank him for his conquest of the grave. I marvel at his sacrificial and triumphant grace. Jesus is Lord. I know it sounds sweet in your ears so I say it again, Jesus is my Lord. Thank you for being so great that you would be so sacrificial. In the name of my Lord and Savior, Jesus the Carpenter, I offer this thanks. Amen.